Love them all, especially the black & white ... beautiful designs. These are gorgeous. Hard to chose a favourite, but I can understand why you got carried away with the stamp set! These are all so pretty. The b/w is stunning. Thanks for sharing. What a gorgeous assortment if designs! They are all terrific! Wow, those are all so pretty, but I absolutely love the black and white one. Thanks for sharing and inspiring us. The rounded swirl stencil makes the card! Love your choice of colors! All these cards are beautiful but the b & w card is simply stunning! Wow! So many pretty designs! My favorite is the black and white card. So many beautiful cards! I love them all. Wow, love your cards, especially that black and white one!!! Thanks for the inspiration! WOW! What a beautiful assortment of cards! I love each of your designs! So pretty! My favorite is the light blue one with flowers... but I really like them all. Gorgeous cards! 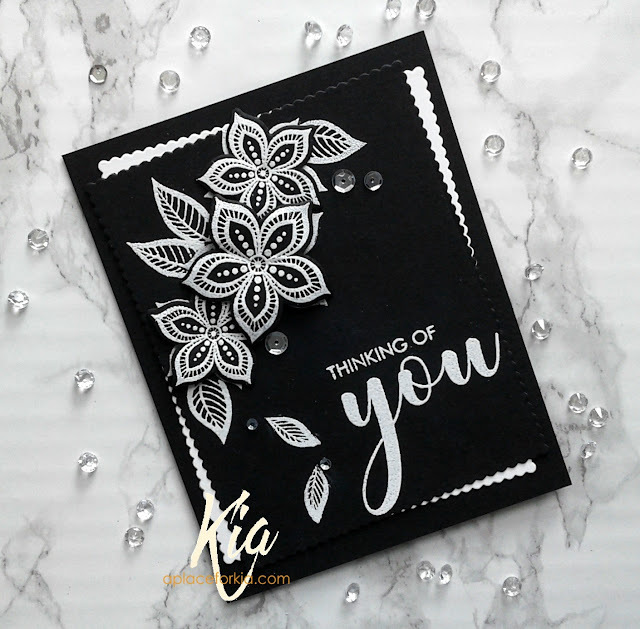 Love all the details and I love the stencil you used on your cards. 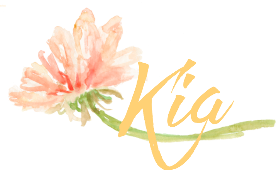 Fun design - thank you for sharing! Your cards are amazing! Love them all!! All are so gorgeous, but really love the circle cut out one! Love all your cards. Love the scalloped edge for the butterflies, very cool. Your cards are all beautiful, love the black and white especially. What a great stamp kit. What a wonderful card! (Actually, ALL of them!!) And I really appreciated some of the tips you shared on your video ... thanks so much for a great tutorial! Love the use of that rounded edge! Love your colors! The flowers and butterflies are gorgeous... awesome mini kit! All beautiful cards, but my favorite is the black and white. Stunning. Thanks for sharing. Thanks for the video. I learned new things. I have not used a stencil with my Misti and you made it look easy. I enjoyed your process learning how you created. Beautiful cards! Thank you for taking the time to show how to do the stencil. I have stencils and have never used them, didn't know what to do with them, lol. Your cards are Beautiful! 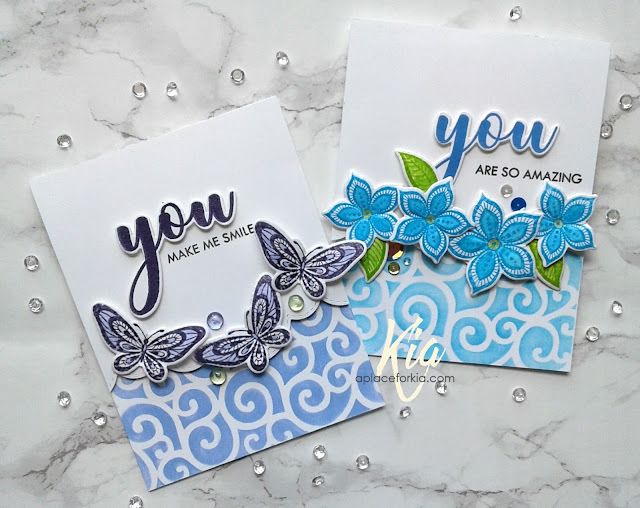 I love the very different cards you created with these stamps and stencil. 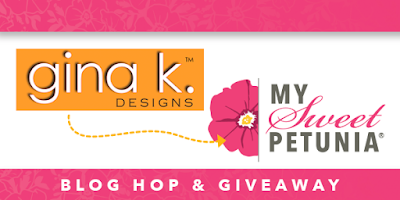 Wow, you have so many gorgeous creations and tips....thank you!!! Your cards are so very gorgeous and elegant. Thanks for sharing your process video! Wow! Your cards are amazing! I don't think I could pick a favorite - they're all that great! Love all of the creative designs! You've got my brain churning! Thanks for sharing your creativity! Love all these beautiful cards! All so pretty! The black and white one is very striking! Thanks for sharing all of these wonderful cards. All your cards are lovely! The back and white is absolutely striking! So much inspiration for using the Boho Flower mini set. Thank you so much for the video showing your techniques! One beautiful card after another. I love them all. Your cards are beautiful, the black and white one really caught my eye! So different. That is what I like to see. This set is amazing and so are your beautiful cards. These are gorgeous! They really pop. WOW! You knocked this mini kit out of the park! Beautiful cards. Beautiful cards. Thanks for the awesome inspiration. Love all the cards but especially the black/white. Simply stunning. Beautiful cards ! Which company makes the "you" die ? Thanks ! Your cards are lovely! Love the b&w and the one with the circle cutout. Great job. Beautiful card designs! Thanks for sharing your process, enjoyed your video. Oh, you used my two favorite colors, black and turquoise. The cards are beautiful. That black and white card is stunning! Wow, I Love All of your cards. They are gorgeous!!! I am in love. Your cards are all just great. Love the colors but the black and white the best. Nice use of the same elements in different ways! Wow your creations are awesome. sooooo pretty! love them all! Your cards are gorgeous! I especially love the black & white one...just stunning! The black and white card is stunning. Pinning! Thank you for sharing. Beautiful creative designs and totally love the black and white. So much loveliness on one page. I couldn't possibly pick a favorite. so many cards and all are knockouts. Just beautiful cards! Love them all, especially the black and white! Thank you for the video! can't decide which of your cards I like the best--they are all great. I love all your designs. What great creativity and gave me some good ideas to follow for making sets of cards for gifts. Lovely cards all of them, great set! Wow you were a busy stamper Im so jealous! All your cards are beautiful Thanks for the fabulous inspiration. All gorgeous! But the black/white - outstanding! Beautiful cards!! I especially like the black and white one. Love them all, but I think I'm especially drawn to the Black and White one!! So many lovely cards, and so much inspiration! Thanks for sharing! Fantastic cards. All of them. Difficult to choose favourite. Congratulations. I really enjoy how you added the flap over the stencil to give the effect of a try fold card. These are all so lovely. If I had to pick one I don't know which it would be. Beautiful cards. Can't wait to try out this stamp set. They are all beautiful cards but I love the black and white. It is so dramatic. Thanks for the inspiration. WOW! These are all great cards. Your cards just make me smile! your cards are all so pretty!!! 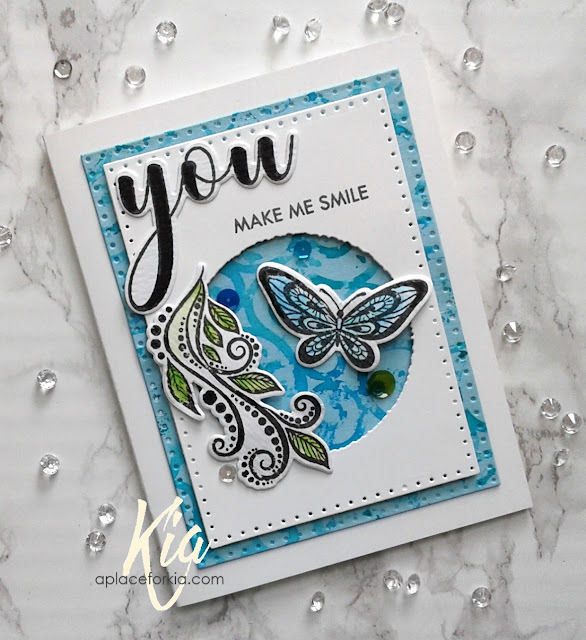 Using a GK scroll stencil with the MISTI worked out great, and I love how you've got the butterflies drifting along the midway point of the card. Super Job. I love all of your cards. I am glad you got "carried away". You are very creative and talented. Thanks so much for sharing your beautiful cards! All of your cards are beautiful! I love how you stenciled the bottom portion of the card. Very pretty cards. Thank you for sharing! Absolutely beautiful creations ! The black and white card is stunning ! Loving the different cards - thank you! Kia, always love seeing your cards on Stamp Junkies. They are gorgeous...this is no exception! You got some serious beauties here! Love the black and white card! Beautiful cards! These would be fabulous gifted together in a boxed set. These cards are just stunning. Love each and everyone of them. Love how you used the black and white bases. wowzers! So many cool cards! But if that B&W beauty landed in my mailbox I'd totally flip out! Any of the others would totally make my day, too.... shall I send my address? lol! 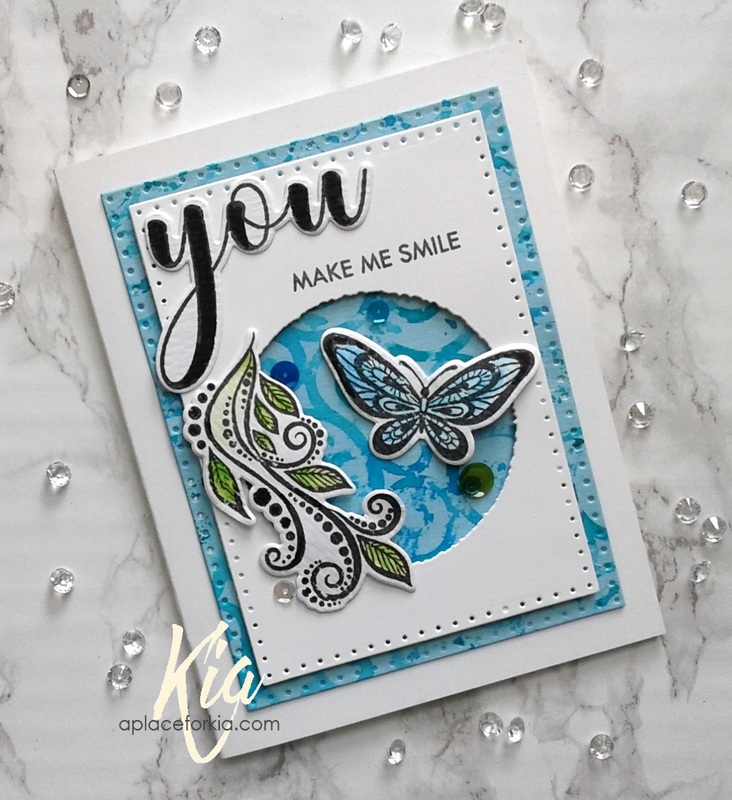 WOW... what a great variety of beautiful cards using this new stamp/die set. Love them all!! love them all. The black and white is stunning! I enjoyed your process video. 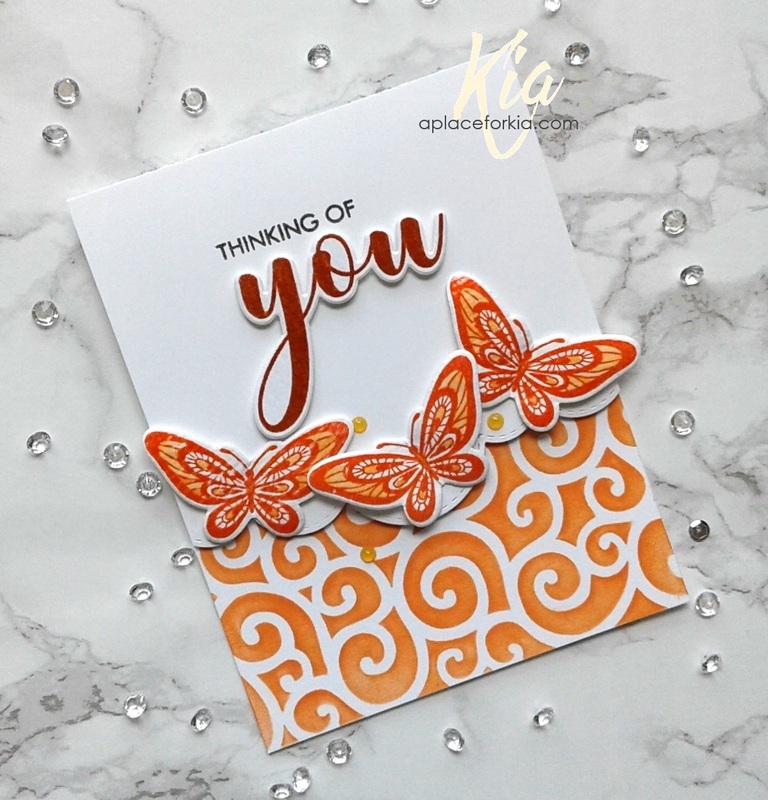 Lovely cards and a great tip for placing sticky stamps! Those flowers are just so whimsical. Love your designs. Amazing shaker card. Love it.